The second and third Foo Fighters albums (1997’s ‘The Color and The Shape’ and 1999’s ‘There Is Nothing Left To Lose’) really raised the bar for radio-friendly alternative rock, with both releases absolutely loaded with fantastic songs. Across the two albums, Dave Grohl more than proved his well rounded talent. In contrast, the handful of albums which followed were predictable, a bit formulaic and as a result, rather lacklustre. None were awful of course, but there was a strong feeling we’d heard it all before. Even the acoustic second half of ‘In Your Honour’, which seemed like a great idea on paper, in reality, didn’t translate into something which could set the world of acoustic rock alight. 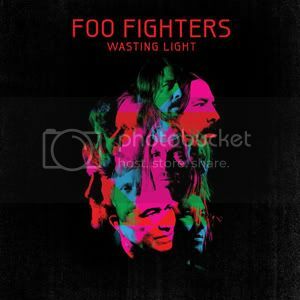 Given then that Dave Grohl and company had appeared to have been going through the motions and playing it safe too often, there was little reason to think that their seventh studio album, 2011’s ‘Wasting Light’ would do anything to break the cycle. However, a few bars into the opening number, something feels different somehow. This may or may not have something to do with Pat Smear’s presence on second guitar, making his first full-time appearance since ‘The Color and The Shape’. Smear’s return is not the album’s only nod to the past either – the disc also boasts a guest performance by Nirvana bassist Krist Novoselic and was produced by Butch Vig, who had last worked with Grohl on Nirvana’s multi-million selling ‘Nevermind’ back in 1991. With an approach to the verses which sounds a little like early Joe Jackson, ‘Dear Rosemary’ shows another side to the Foo Fighters. The spiky rhythm is complimented by some great playing from everyone concerned, particularly Nate Mandel, whose bass sound has a great presence. The track also features ex- Hüsker Dü /Sugar frontman (and legend) Bob Mould, who contributes guitar and vocals. Clearly the guitars offered by Smear and Chris Shiflett would have been adequate enough, since Mould’s work remains indistinct. When you consider how distinctive Mould’s shrill guitar tone has been, particularly during his Hüsker Dü years, it wouldn’t have been so hard for him to add something similar here, to really make his presence felt. It’s not until the close of the number, when Mould can be heard clearly on second vocal, his contribution is really obvious. Naturally, there are still moments where the band retreats to the safety of their stadium rock stylings. The weakest of these tracks, ‘These Days’, is a dull retread of something which sounds like it belongs on the Foos’ 2002 outing ‘One By One’. Also with a focus on big riffs and a radio-friendly chorus, ‘Miss The Misery’ features some crisp rhythm guitar work and decent vocals; but despite being extremely well written, it’s a number which could do with a little of the energy that’s in abundance elsewhere. Lead single ‘Rope’ fares a little better, thanks in no small part to a slightly quirky rhythm during the verses and big rock section near the end. Taylor Hawkins’s drum work throughout the number creates enough interest to sustain momentum. Neither ‘Miss The Misery’ or ‘Rope’ are bad enough to skip, but there are better examples of this style in the Foo Fighters’ back catalogue. Sometimes, though, familiarity isn’t a bad thing, as proved by ‘Arlandria’. With quiet verses full of muted chords, building to a sing-along chorus, it could be described as Foo Fighters by numbers. However, by having a chorus which lodges firmly inside your head after two or three plays, it’s an instant classic. Well constructed with enough oomph to make a decent rocker, yet with a commercial edge that’s meant for radio play, ‘Arlandria’ is one of ‘Wasting Light’s absolute crackers. Almost equally appealing, ‘Back & Forth’ moves almost into power-pop territory on occasion, with a chorus that has a slight Cheap Trick influence. Shiflett’s muted chords may raise a smile, since they sound exactly like those Shiflett used previously on the Me First & The Gimme Gimmes version of The Cars’ ‘Just What I Needed’. On the negative side, the vocals on the pre-chorus seems a little droney, but hang in there, since the harmony-fuelled pop/rock chorus which follows is one of the album’s best. ‘I Should’ve Known’ is a slow number which presents the band in a more reflective mood. Grohl’s vocals are heavily filtered, but this is balanced by the clear quality of Shiflett’s guitar. Krist Novoselic’s guest performances on bass and accordion seem, at first, understated. To begin with, his bass part appears particularly pedestrian, but it’s deliberately misleading… Near the track’s end once everyone starts to rock out, the bass is full of anger; a fuzzy sound partly recalling Novoselic’s Pixies-inspired style from way back when. The bass work is definitely the high point here. Granted, ‘Wasting Light’ is an album which brings few musical surprises, but it captures Grohl and company on good form, often playing with a renewed sense of vigour. Since it features a handful of terrific numbers and little in the way of filler, while it still doesn’t quite live up to those standards set by the early albums, it certainly comes close. Agreed. The whole album feels a little more care free and fun than the last few efforts. In my opinion ESPG was the Foos worst album, and while this is halfway similar to In Your Honour, this feels far more loose and less 'targetted'. Great review – i saw your link on the BBC review of this and you have done a far more measured and well thought out review!